Both rappers have taken vocals recorded by Aaliyah before her death in a 2001 plane crash and used them on new tracks this year. Now the music producer has told Revolt TVL: "People always say I will do a song with Aaliyah. It will never work. Chris Brown got a record with her, it don't work. Drake will do a record with Aaliyah, it aint gonna work. "Aaliyah music only work with her soulmate, which is me." Aaliyah was Timbaland's protege. He worked extensively with her and has previously told of how devastated he was by her death. 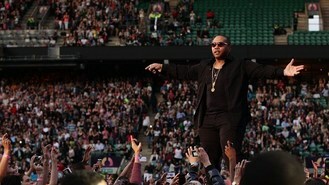 But Timbaland also told how he admired Drake and told Jay Z they had to "embrace this young soldier". He said: "When Drake did Started From The Bottom it was a totally different sound and Drake told me, he said, 'I had to really battle with myself. I want to be the first to change'. That's when I knew he was going to be around for a long time. "So I talked to big brother J and I was like 'Yo we gotta embrace this young soldier. He's really trying to add to the blood line."